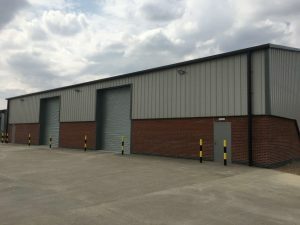 Taylor Lindsey has completed and handed over a new warehouse building to Lincoln-based real ale wholesalers, Small Beer. The building completes the Churchill Business Park development on Sleaford Road, Bracebridge Heath and adds a further 10,000 sq ft to the 22,000 sq ft already leased to the company. Small Beer moved to the site five years ago, enabling the business to expand and broaden its offer, creating the need for further additional space and leading to the new building that has just been completed. Dan Race, Development Director with Taylor Lindsey, said “Small Beer is a Lincoln-based, family-owned company operating very successfully from the city and we are pleased to have been involved in their expansion in this way”. The Churchill Business Park development comprises the two Small Beer buildings and the ‘Seven-0-Seven’ units; a development of 19 small industrial/warehouse units built by Taylor Lindsey in partnership with North Kesteven District Council and leased to small businesses operating in the locality.